Noise generated by offshore construction work, such as piling during wind farm construction has potential to affect marine wildlife. As a result, in Europe, industry is obliged to undertake measures to monitor and reduce noise levels during offshore construction activities. The strictest guidelines in the world are currently in Germany, where OSC has been working since 2004. Pile driving for windfarm construction is classified as multiple pulses, which are normally brief, broadband, atonal and periodic. In addition to pile driving noise, background noise, which is treated as continuous sound, must also be measured as a baseline for comparison. 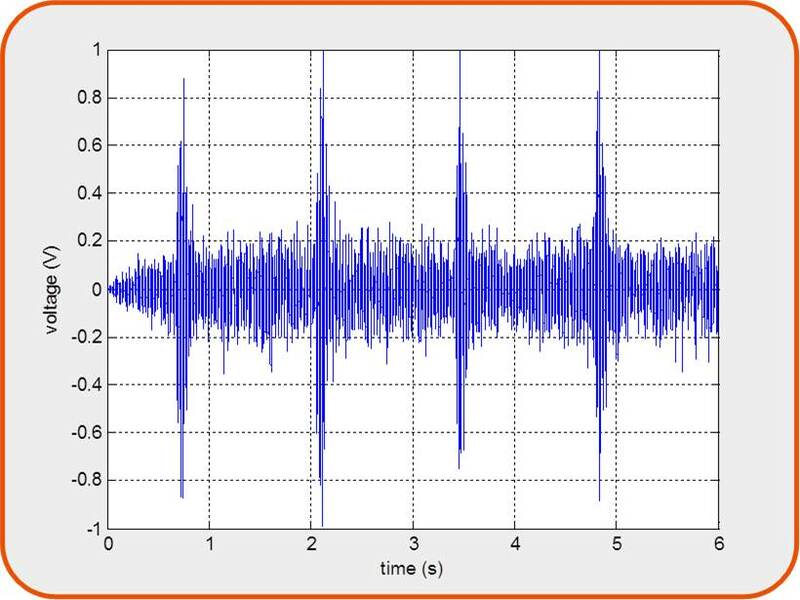 Example of pile-driving noise (transient signal) at a range of two km from the hydrophone at 12 m depth. This graphical representation is called a waveform, and shows the acoustic signal’s amplitude in volts versus time in seconds at a given instant. OSC custom-developed software was used for signal processing © OSC, 2012. Since company incorporation in 2004, OSC’s considerable experience of working to Joint Nature Conservation Committee (JNCC) guidelines and Marine Management Organisation (MMO) requirements for various industries has given us an in-depth knowledge of guideline/regulation interpretation and application in the real world. OSC’s Marine Mammal Mitigation Plans (MMMPs) set out a mitigation methodology and reporting for any instances of Unexploded Ordnance (UXO) detonation and piled, or part-piled, wind turbine foundation installation. OSC work with the MMO to ensure a final MMMP is agreed. More specifically, OSC’s MMMPs are consistent with the Statutory Nature Conservation Agency protocol for minimising the risk of injury to marine mammals from piling noise (JNCC, 2010b), explosives, if applicable (JNCC, 2010a), and comply with our client’s Energy’s Development Consents Order (DCO) granted by the Secretary of State for the Department of Energy and Climate Change (DECC). OSC has years of experience working with the Bundesamt für Seeschifffahrt und Hydrographie (BSH) (German Federal Maritime and Hydrographic Agency) in German waters, and in 2004, was the first British company to win a German underwater noise modelling study. Since then, the rules have changed, and OSC has modified underwater noise measuring protocols (and equipment) accordingly. To date only Germany and Belgium have issued values. In Germany, the threshold value issued by the Umweltbundesamt (German Federal Environment Agency, UBA) is based on data collected in a single scientific study on one harbour porpoise exposed to seismic airgun noise (Lucke et al., 2009). These regulations, which are now binding legally, are described by de Jong et al. (2011) as a threshold consisting of a dual criterion of 160 dB re 1 μPa²s Sound Exposure Level (SEL) and 190 dB re 1 μPa² (peak-to-peak Sound Pressure Level, SPL), that should not be exceeded at a distance of 750 m around the noise (piling) site. This threshold has been based on a Temporary Threshold Shift (TTS) found in the harbour porpoise at 164 dB re 1 μPa²s SEL and 199 dB re 1 μPa² (peak to peak SPL); thus, the chosen values include some safety adjustment (de Jong et al., 2011). Details of the range of underwater noise monitoring equipment used by OSC around the world is described on www.osc.co.uk/services/underwater-noise-assessments-modelling/ but all OSC noise measuring equipment complies with BSH standards (BSH, 2011; BSH, 2013a). 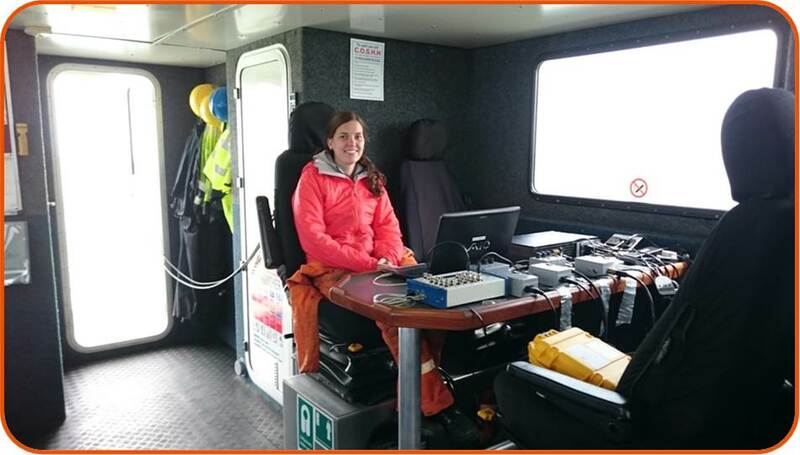 OSC Senior consultant undertaking noise measurement of wind farm pile-driving from a vessel © OSC 2015. OSC’s marine mammal habitats assessment methodology complies with all standards outlined in BSH (2013b). We have been using arrays of T-PODs and C-PODs to assess harbour porpoise habitat behaviour and cumulative noise impacts for windfarms in German waters since 2004, and throughout the world generally. 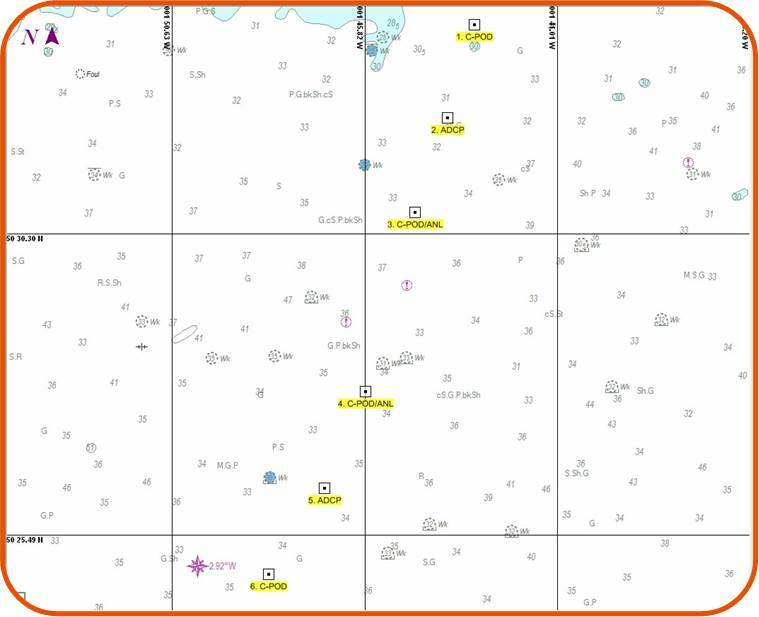 Survey area and mooring locations of C-PODs, Ambient Noise Loggers (ANLs) and Acoustic Doppler Current Profilers (ADCP). Depths in m, WGS84 coordinates, using Mercator projection. Navigational charts supplied by OSC (using Nobelec VNS max Pro and C-MAP data). © OSC 2011. For inshore projects, OSC can supply their own vessel. For offshore projects, larger vessels are required, for which OSC can charter. Between 2004 and 2015, OSC has undertaken fifteen underwater noise projects in Germany, seven in the UK, and has published in peer-reviewed journals. OSC are 100% familiar with the requirements set out in the BSH documents, and other similar non-German projects elsewhere. 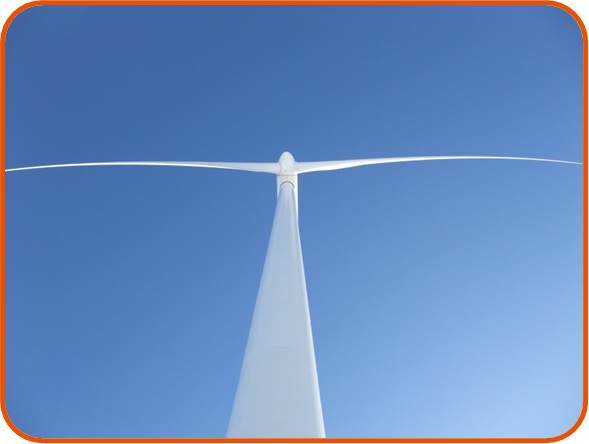 A list of our windfarm clients can be found here (www.osc.co.uk/clients/). A full list of references is available upon request. OSC has an Integrated Management System (IMS) that is certified to International Organization for Standardization (ISO) 9001:2008, ISO 14001:2004, and Occupational Health & Safety Assessment Series (OHSAS) 18001:2007 standards. OSC is also registered on Achilles’ UVDB database. BSH (2011): BSH-Standard: Offshore Wind Farms – Measuring Instruction for Underwater Sound Monitoring. 31. BSH (2013a): BSH-Standard: Offshore Wind Farms – Measuring Specification for the Quantitative Determination of the Effectiveness of Noise Control Systems. 20. BSH (2013b): Standard – Investigation of the impact of offshore wind turbines on the marine environment (StUK4). Bundesamt für Seeschiffahrt und Hydrographie (BSH), Federal Maritime and Hydrographic Agency, Hamburg und Rostock 2013, pp. 87.
de Jong, CAF, Ainslie, MA, and Blacquière, G (2011): Standard for measurement and monitoring of underwater noise, Part II: procedures for measuring underwater noise in connection with offshore wind farm licensing. TNO report, TNO-DV 2011 C251. 56 pp. JNCC (2010a): JNCC guidelines for minimising the risk of injury to marine mammals from using explosives. Joint Nature Conservation Committee, Aberdeen, UK. 10 pp. JNCC (2010b): Statutory nature conservation agency protocol for minimising the risk of injury to marine mammals from piling noise. Joint Nature Conservation Committee, Inverness. 14 pp. Lucke, K, Siebert, U, Lepper, PA, and Blanchet, MA (2009): Temporary shift in masked hearing thresholds in a harbor porpoise (Phocoena phocoena) after exposure to seismic airgun stimuli. Journal of the Acoustical Society of America 125, 4060–4070. Southall, BL, Bowles, AE, Ellison, WT, Finneran, JJ, Gentry, RL, Greene, CR, Kastak, D, Ketten, DR, Miller, JH, Nachtigall, PE, Richardson, WJ, Thomas, JA, and Tyack, PL (2007): Marine mammal noise exposure criteria, initial scientific recommendations: Aquatic Mammals, Vol. 33. pp. 411-414.